As you can see I've had my eye on a fair few mugs from the Disney Store recently! 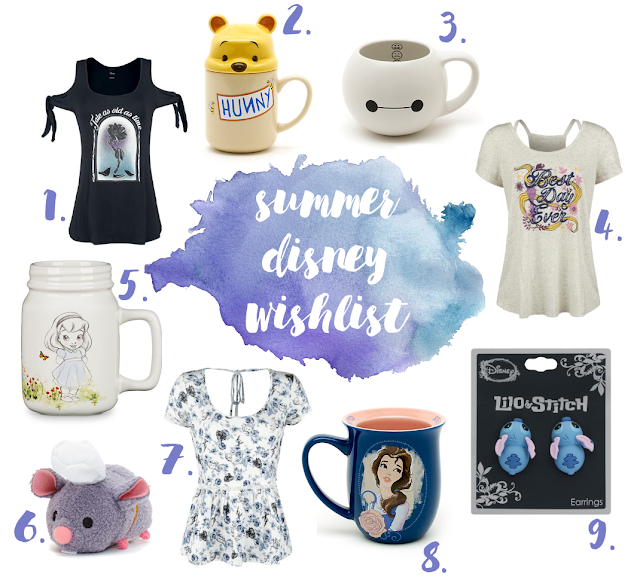 Their mug designs seem to be getting better and better and I've been loving the new Princess ones, especially this Belle one (#8). I'm trying to limit my mug buying at the moment as we're about to move into a tiny (but adorable) new flat but I don't think I'll be able to resist this one much longer! EMP have also been killing it recently with their Disney clothes. I happened to be on a train when I spotted the Best Day Ever shirt on their website (#4) and I actually said "oh my god" out-loud, haha! I'm going to have to scrape some pennies together to buy this to wear on a future Disney trip! And finally how ridiculously cute is this Remy Tsum Tsum (#6)? He's being released tomorrow morning and I will definitely have to get my paws on him. His little chef hat is just an ILLEGAL level of cuteness. What Disney finds have you come across recently? I love sooo many of these things - especially the BATB stuff.